People have used this strategically favourable position ever since the Neolithic period. However, its principal settlement coincides with the period of the Late Middle Ages, when a Great Moravian feudal court dating from the mid 9th-10th centuries stood here, protected by a huge palisade fortification. 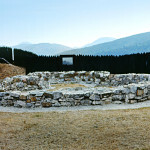 The internal fortification grounds, divided into three unequal parts, delineated a special space for the rotunda, with a semicircular apse surrounded by a burial ground. 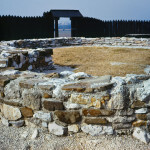 Although the court perished between the 11th and 12th century, burials continued around the rotunda until the 14th century. The shape of the fortification and the ground floor plans have been reconstructed on the basis of the results of archaeological research.